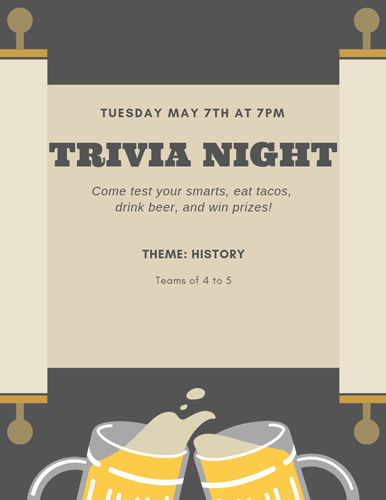 Trivia Tuesday - History Night! If you could choose to live a different time period for a day, which would it be? The roaring 20’s, Shakespearean times, or mid evil times? Before you choose, be sure to know all the facts first! Calling all historians and history buffs! Trivia Tuesday is going back in time to see how well your team knows major historical events! Dust off those old history books and come join the fun! History night takes place on Tuesday May 7th at 7:00pm. Trivia Tuesday - Alcohol Night! Trivia Tuesday - 90's Night!